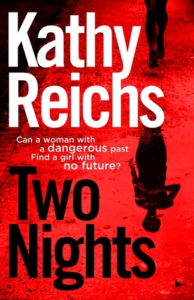 Having never read a Kathy Reichs novel before I was looking forward to reading Two Nights, a combination of crime and thriller as our protagonist is contracted to find a missing person. Sunday Night lives alone and very much likes it that way, enjoying her isolation and only communicating with her reasonably tame squirrel. What she does not want is to be bothered with requests, so is far from impressed when her foster father turns up on her doorstep with the offer of a job. The job in question promises to pay well and comes from a woman for whom money is no object, and she has specifically chosen Sunday for the task. Despite her unconventional upbringing and wayward past, Sunday was part of the military police and had a great eye for investigative work, not to mention being able to look after herself. Since an incident left her with damaged vision in one eye and a nasty scar, she has kept to herself and shown no desire to return to active work. However, she can’t resist a mystery and this particular case piques her interest to the point where she can’t turn it down. Her task is to find the woman’s granddaughter, the only believed survivor of the bomb blast which killed her mother and brother. The family were caught up in the bombing of a Jewish school, believed to be the work of an anti-Semitic cult, with the girl’s body nowhere to be seen. If she is still alive then Sunday must rescue her, but avoid putting other lives at risk along the way. For help she contacts her brother, August, forming a formidable duo who won’t stop until they’ve achieved their goal. I thought that the plot of this book was exciting at first, as we track the culprits across several US states and see Sunday use some very clever surveillance techniques. However, she seemed too omniscient, being able to predict the cult’s next move without trying and rarely putting a foot wrong. I wanted to puzzle it out with her and Gus, but instead we are openly told every thought pattern and not left with the feeling of suspense I was hoping for. I also found elements of the plot confusing, as not everything was explained in as much detail as it needed, with it being easy to confuse the gang members. I also struggled to connect with Sunday as a protagonist, as she remains aloof and distanced from the reader, letting us in to her deductions but not much else. She has quite an attitude problem, which can lead to some amusing quips but starts to grow irritating after a while, especially when targeted at those who are actually trying to help. I was hoping for more of an insight into her past and how this has shaped her, so I don’t know if Reichs intends to save this for a future book or if this was intended to build character intrigue. This same intrigue extends to her brother, Gus, who has her back no matter what and always seems to know what Sunday needs without asking. It is his calmer approach that keeps the book on some kind of level, without descending into the all-out carnage which would ensue if Sunday had her own way. Gus was witty and could counter her bad moods, almost making me wish he was the protagonist instead. Like Sunday, there are many unanswered questions about him, but so far this is a standalone novel and so there may never be answers. This makes my first foray into Reichs’ fiction a little disappointing, as I had high hopes for this book and wasn’t as excited by the story as I wanted to be. Yes, the mystery is fast-paced and easy to read, but the characters don’t feel well-rounded enough to carry the complex mystery off, especially with the tone being so dark. There is very little lightness to the story other than Gus, so unfortunately this is not a series I will be persevering with. However, I would still very much like to read Kathy Reichs’ other series in the future, with the writing style still being strong and the plot intriguing.